Linotype: The Film is a feature-length documentary centered around the Linotype type casting machine. Called the "Eighth Wonder of the World" by Thomas Edison, it revolutionized printing and society. The film tells the charming and emotional story of the people connected to the Linotype and how it impacted the world. The Linotype (pronounced "line-o-type") completely transformed the communication of information similarly to how the internet is now changing communication again. Although these machines were revolutionary, technology began to supersede the Linotype and they were scrapped and melted-down by the thousands. Today, very few machines are still in existence. Documentary directed by Doug Wilson. First NZ Screening very happily presented by Wellington's Design Meetup. 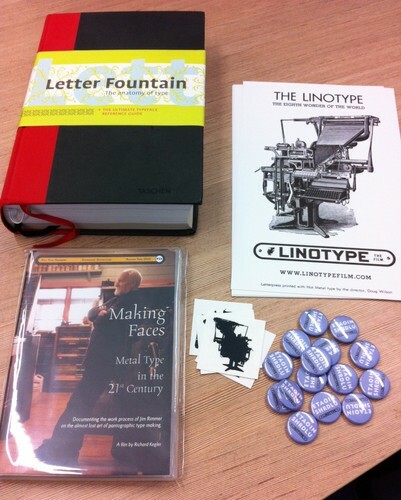 Here's a photo of the prize giveaways for tonight's Linotype screening. Great stuff!